Maltese Angel Babies Blog: What Is Maltese Angel Baby "Disneyland"
What Is Maltese Angel Baby "Disneyland"
Most people have heard that Disneyland is the happiest place on earth for children and adults alike. It's a place created for fun that's filled with color and wonder. Well, that's the type of environment I create for my Angel Babies and highly encourage you to replicate. 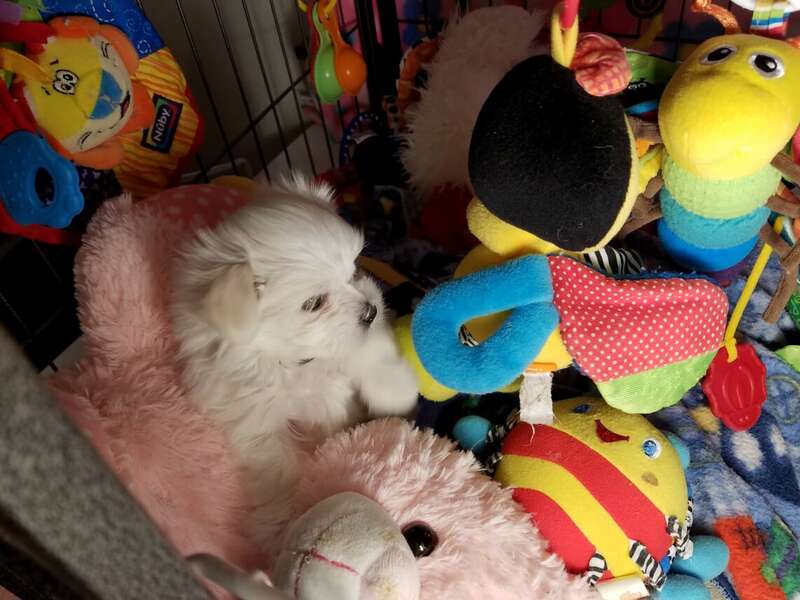 What you see above is a self contained 24/7 wonderland for puppies, especially small ones like the Maltese breed. Now that you see what it includes, ask yourself, "Where will I put my puppy when I bring him/her home"? Your puppy will be a little over 1lb when you go home. You can't hold your baby all day. You also have a life apart from baby. You cannot put the infant puppy on the floor and walk away. Would you do that to a human baby? How will you get anything done while worrying if the baby is safe, has food to eat, their potty needs are met, has something to play with, is warm enough and is happy? It is for all of the above reasons that I created this environment to meet all of those needs and more. 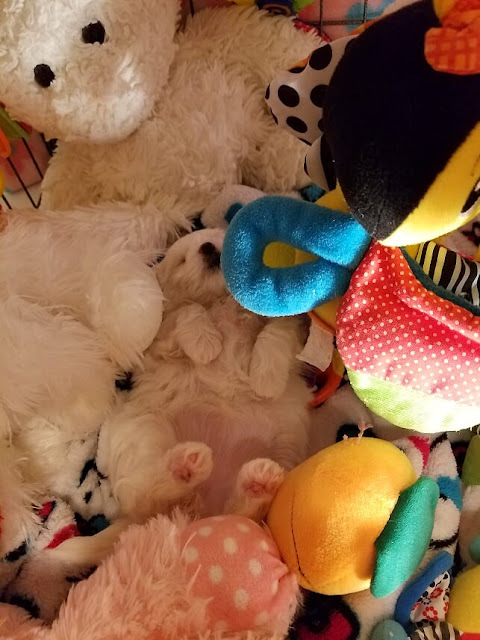 So, Disneyland is a win win for puppy's needs and yours. Never again will you wonder why you got a puppy! Instead, my Angel Baby parents say that this was the easiest puppy they have ever had due to Disneyland! I highly recommend that all of my Angel Baby parents create their own Disneyland for their baby. 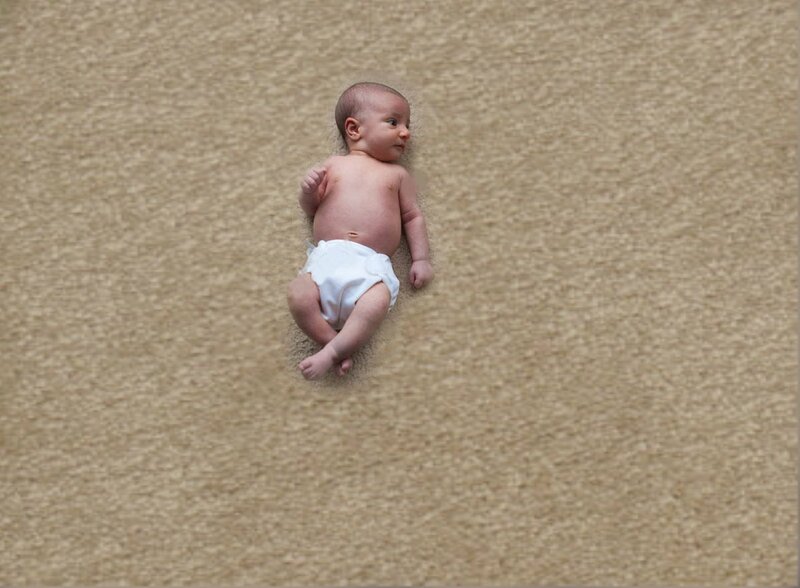 In doing so, you will have a seamless transition from my home to yours when baby comes home. It makes all the difference for puppy when moving to a new home and bonding to new people and situations! In the next post I will discuss all aspects of how to make your own Disneyland. There is more to it than you may think. PUPPYLAND........absolutely adorable. These guys are sooooooooo happy! NOTHING looks run down or dangerous. Anxious for your next blog! Larry and I have had RITZY for one week! She is PERFECT! We can't say enough about 'Disneyland'! Since our arrival home (very 1st night) we have used it! The transitions from Sally's (breeder) to our house has gone without a hitch. We have had NO issues of adjustment or frustration! NO accidents, barking, whining, etc! AND, Ritzy is using her pee-pee pads perfectly as Sally told us she would. QUESTION? 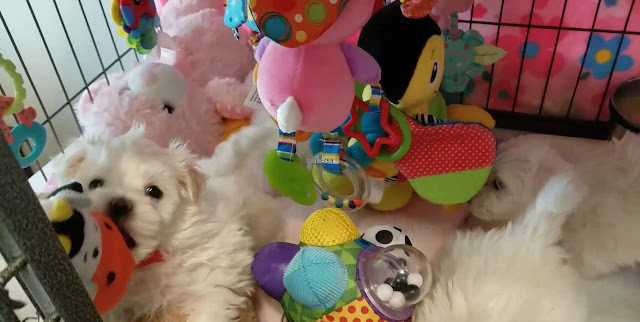 Have YOU thought about what you're going to do with with your new puppy when you bring it home? That is what Sally asked us... Where will you keep her? Or even as time passes by (1 year or longer)? 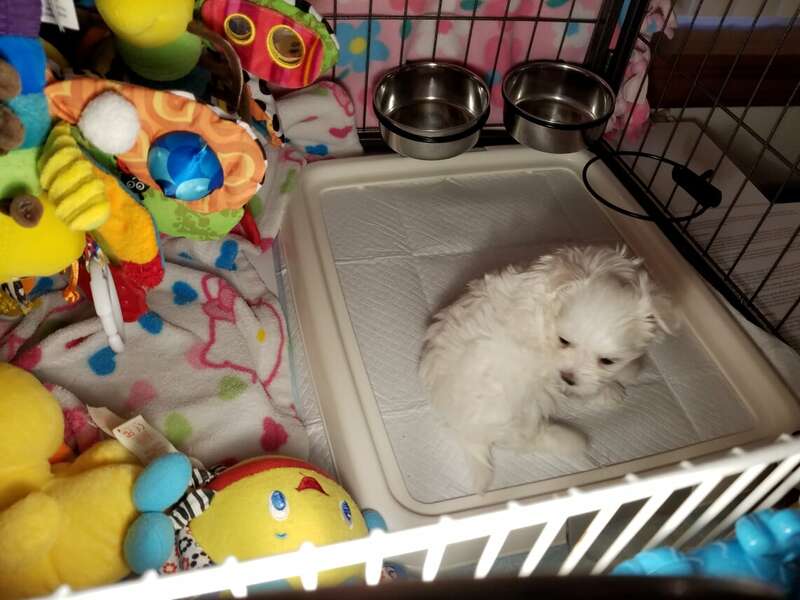 Where will your puppy stay? Be safe? Go potty?, etc.? Especially when you're not home? (working or shopping)? The answer is: DISNEYLAND! RITZY LOVES IT! We have one at home and one at our office! You can't play with them or hold them 24/7 (even though you would like to). They need a place where they feel safe and warm! that makes bringing a new puppy home wonderful for ALL! THANK YOU SALLY for ALL your outstanding ideas and information you give to Angel Babies Parents. This has been one of our best experiences we have ever had! We are loving our new beautiful puppy, RITZY & we are forever friends! Disneyland for babies? It truly is. Sally thanks again for taking all of the guesswork out of what to do with baby when you get home. 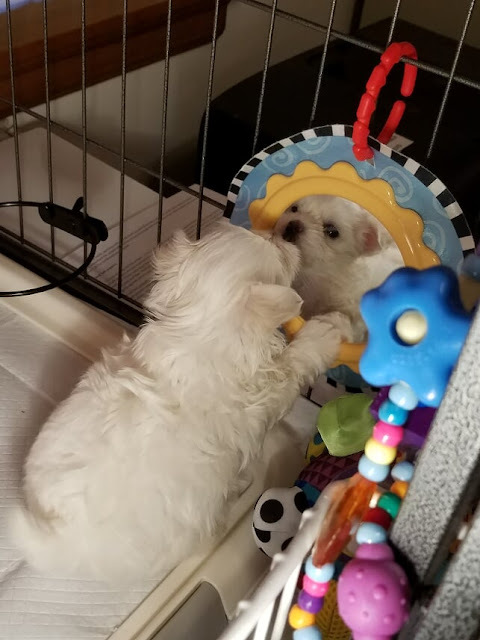 Out of the 5 Maltese puppies we have raised over the last 26 years, Disneyland is by far the best way I have used to raise and acclimate our new baby. Our baby Cassi will be a year old this month and she still loves her Disneyland home. Since she is potty trained Cassi has the run of the house now. So I put Disneyland on the floor for her and she still loves to go in there on her own to play, nap, or just lounge around. It's truly one of the happiest places on earth for our baby! For all of you about to become parents of an Angel Baby, Disneyland will truly make a huge difference in your new babies happiness. Just follow the information above, or better yet call Sally...she has all the answers! "Disneyland" is a great concept. I wish I would have done this for my previous babies. I'm sure they would have loved it! Looking forward to my new baby having an easy transition utilizing the "Disneyland" method. 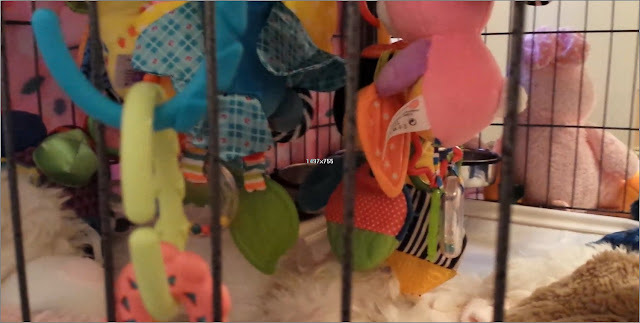 Through talking with Denise and Sally and reading the comments we have every faith that Coconut is going to love his Disneyland and we'll have smooth sailing during his first few months with his new Mom and Dad. 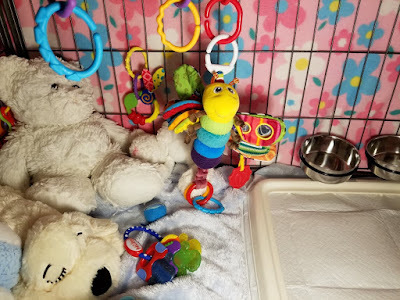 Sally's idea for rings to hang toys from the top of the crate was a great solution to my problem of how to make a "mobile" type toy for him. Puppy Disneyland is the greatest! My family has had Maltese for many years, and when it was finally time for my fiancé and I to get a baby of our own, Sally’s system made everything so much easier! When we brought home our Lacie the transition was almost seamless. There were no lost nights of sleep, she used her poddy pad, she knew where she could find everything that she wanted, and it allowed for a much simpler process when we began to give her more freedoms around the home. We could tell that Lacie truly felt safe when she was in there, and she had fun too!